Pearl has shared her Gonzo Wine Out stain remover review, and how it worked on her carpet. 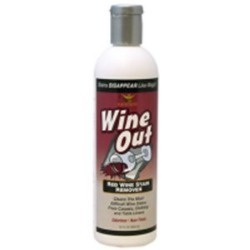 Wine Out is the best red wine stain remover I have ever used. I was having a party at my house and I had a coffee table that had a broken leg. We were all having a great time feeling a little tipsy when someone placed the bottle of wine onto the table. Well someone bumped into the table and knocked the bottle of wine on my light colored carpet. I tried to clean it the best I could and the stain would not come out. I went to my local home good store and found this stuff called Wine Out! I took it home and sprayed it on the carpet and followed the directions. The entire stain came out with no problem. It was amazing and I would recommend it to anyone. It comes in a little spray bottle which is very convenient for travel. If you were to get it on your clothes it would be very handy. Thanks for your Gonzo Wine Out stain remover review. Red wine stain removal can be very difficult, especially on carpet, since you can't even take it up and wash it. Has anyone else used this product? If so, I would love to hear your experiences with it good or bad. Not only is this stain remover safe for use on carpets, as Pearl used it, it is also for use on clothing, table linens, and upholstery. I would love to hear your experiences with one of these fabrics or surfaces too. You can share your wine stain remover review here, for this or another brand, sharing how it worked for you. You can also read other reviews that have already been submitted.